SUMMARY: Hemangioblastomas of the central nervous system are the most common tumors seen in patients with von Hippel-Lindau (VHL) disease. 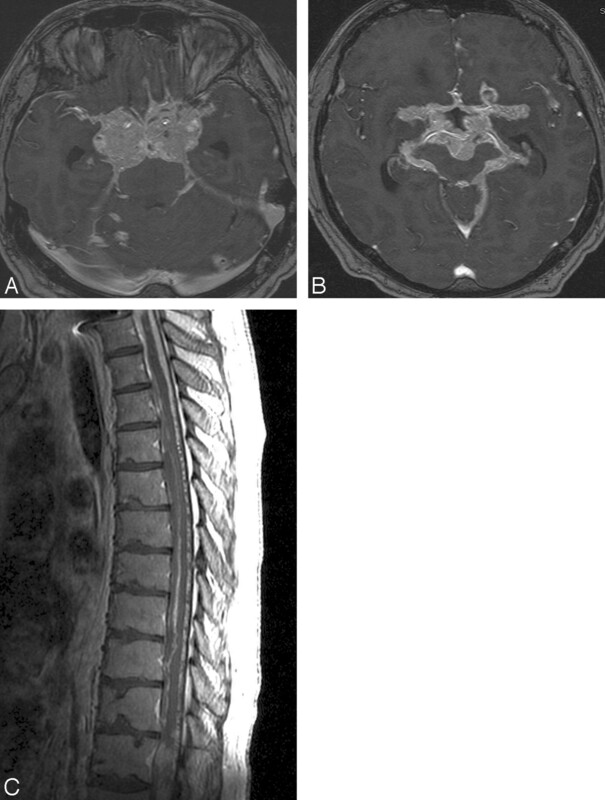 A very rare case of diffuse leptomeningeal hemangioblastomatosis obliterating large areas of the subarachnoid space, both intracranial and within the spinal canal, which developed during a relatively short period, in a patient with VHL disease is presented. We report a case of a 53-year-old man with aggressive spinal and brain leptomeningeal hemangioblastomatosis that developed in a relatively short period. A 53-year-old white man diagnosed at age 43 years with VHL disease (type II-B, according to the National Institutes of Health classification) had initially presented with neck pain and visual disturbances. Before enrollment, patient had undergone a suboccipital craniectomy for the removal of a cerebellar HB. Brain and spinal MR imaging revealed 1 large HB at the anterior aspect of the pons and several tumors in the cerebellar hemispheres on admission. An additional HB was present on the anterior aspect of the spinal cord at the level of C6–C7. A syrinx was present in the thoracic spine without evidence of other abnormalities. MR imaging scans of the brain demonstrated no leptomeningeal involvement. Retinal HBs were also found during ophthalmologic examination. Imaging studies of the abdomen demonstrated bilateral adrenal tumors and multiple cystic and solid tumors in both kidneys. In the following months, the patient underwent several surgical procedures, which included a right nephrectomy and a partial left nephrectomy for renal cell carcinoma, and bilateral adrenalectomies for the removal of pheochromocytomas. The tumor of the cervical cord was removed surgically, and immediately after recovery, the tumor of the pons was treated with radiation. On follow-up MR imaging scans, the tumor in the pons and the small cerebellar tumors appeared stable without evidence of growth. Approximately 2 years after completion of radiation therapy, an infiltration of the leptomeninges in the suprasellar cistern and in the spinal canal by HB had developed. Within the next 2 years, this process became gradually worse, with infiltration of the leptomeninges surrounding the cerebellar hemispheres, the brain stem, and the leptomeninges in the Sylvian fissures and the quadrigeminal cistern. There was tumor invasion of the hypothalamus, the temporal lobes midbrain, and brain stem. The optic chiasm, the arteries of the circle of Willis, and the basilar arteries were encased (Fig 1A, B). Extensive tumor invasion also progressed into the spinal canal, with prominent infiltration of the leptomeninges around the entire cord and the cauda equina (Fig 1C). From a clinical standpoint, the patient complained of increasing-intensity headaches, memory loss, and confusion. Multiple cranial nerve palsies primarily involving the III, IV, V, VII, and VIII nerves also developed. Shortly thereafter, the patient died of CNS decline and respiratory insufficiency. A and B, MR axial, postgadolinium images of the suprasellar region, obtained with use of the SPGR technique, demonstrate numerous hemangioblastomatous tumors surrounding the extraorbital parts of the optic nerves, the optic chiasm, the sella, and the arteries of the circle of Willis. C, Sagittal, postcontrast T1-weighted image of the thoracic spine shows diffuse leptomeningeal infiltration by hemangioblastomas. Autopsy confirmed the presence of extensive tumor infiltration of the leptomeninges intracranially and in the spinal canal. On histologic examination, there was abundance of characteristic stromal cells with unusually large nuclei, small amounts of cytoplasm, and extensive epithelioid growth. There was also very prominent tumor vasculature with innumerable capillaries intervening between small nests and individual cells. Immunopexidase studies revealed positive neuron-specific enolase and negative epithelial membrane antigen, confirming the diagnosis of HB. HBs are known to be benign tumors and, once removed, do not usually recur at the surgical site unless a new mutation develops in the cells of the surgical bed. It has been reported that late recurrence occurs after surgery in only 15% to 25% of cases.4 The relative benign nature of these tumors has also been documented by the finding of Reyns et al,6 who reported that the recurrence rate is approximately 19 years in patients with VHL disease and 11 years in patients without disease. Diffuse and extensive leptomeningeal infiltration by HBs similar to that in our patient is an exceedingly rare phenomenon. The term leptomeningeal hemangioblastomatosis was first introduced by Bakshi et al5 to describe this unusual presentation. In a recent review of the literature, a total of 15 cases were reported with spinal infiltration but without supratentorial infiltration on imaging; 6 cases were associated with VHL disease and 9 caused by spontaneous mutations.7 In the case of our patient, hemangiomatous lesions were also located supratentorially. The involvement of the leptomeninges first appeared 2 years after surgical resection of the HB in the cervical cord and 2 years after completion of radiation therapy of the tumor of the pons. Infiltration was widespread and included the spine, the infratentorial brain, and the supratentorial brain. Soon after the development of the leptomeningeal disease, the growth of the tumor progressed relentlessly and led to the patient's death 2 years later. The exact cause of this unusual biologic behavior observed in leptomeningeal hemangioblastomatosis has been debated but remains problematic. Bakshi et al5 suggested that this phenomenon occurs as a result of release by tumor cell factors that promote aggressive angiogenesis or increase vascular permeability. Mohan et al10 suggested that 1 or several other gene mutations, in addition to the VHL gene, may have induced this type of rapid growth and dissemination.10 Other investigators suggested that the underlying cause is uncontrolled angiogenesis from overexpression of vascular endothelial growth factors.3 Mechanical dissemination of tumor cells into the subarachnoid space after surgery or malignant transformation to angiosarcoma has also been speculated.7 Regardless of the cause(s) of leptomeningeal hemangioblastomatosis, this complication represents an ominous sign for which there is no specific treatment. In conclusion, we present an aggressive case of disseminated meningeal hemangioblastomatosis involving both the spine and the brain that led to rapid clinical decline and eventual death. The exact causes of this rare complication of CNS HBs are not yet identified. Author Contributions: Guarantors of integrity of entire study: N.A.C., N.J.P. ; study concepts: N.A.C., N.J.P. ; definition of intellectual content: N.A.C., N.J.P., P.K.P. ; literature research: N.A.C. ; manuscript preparation and review: N.A.C., N.J.P., P.K.P. ; manuscript editing: N.A.C., N.J.P., P.K.P. Accepted after revision September 10, 2008.